Officials, former athletes, coaches, district and community supporters were on hand October 25, 2016 for the official renaming ceremony for the Chris Dyer Gymnasium. DESOTO—Chris Dyer is synonymous with high school basketball in North Texas. With five State Championships, one as an assistant coach and four as the head coach, Coach Dyer has spent 34 years coaching in Dallas and DeSoto ISD. With an overall record of 692-166 (80% winning record), Coach Dyer has also impacted thousands of young men with his tough yet compassionate coaching and teaching style. 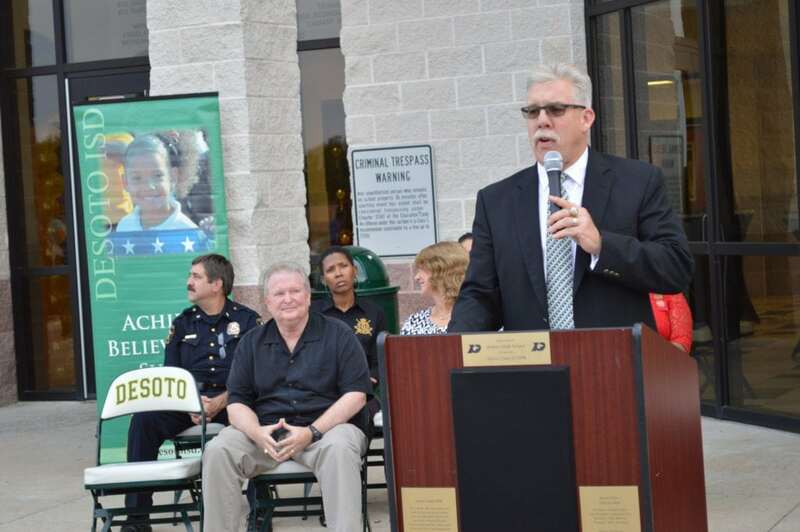 On October 25, fans of both his coaching abilities and his tough love were on hand for the dedication ceremony to name the DeSoto High School competition gym in his honor. Coach Dyer has long held that the best each individual can do is to treat others the way in which you want to be treated – a message that resonated throughout the ceremony! DeSoto ISD, proudly displaying the three State Championship trophies won in 2003, 2009 and 2016, hosted a ceremony worthy of his lifetime of accomplishments right in front of the gymnasium with the new lettering in place high above the crowd. 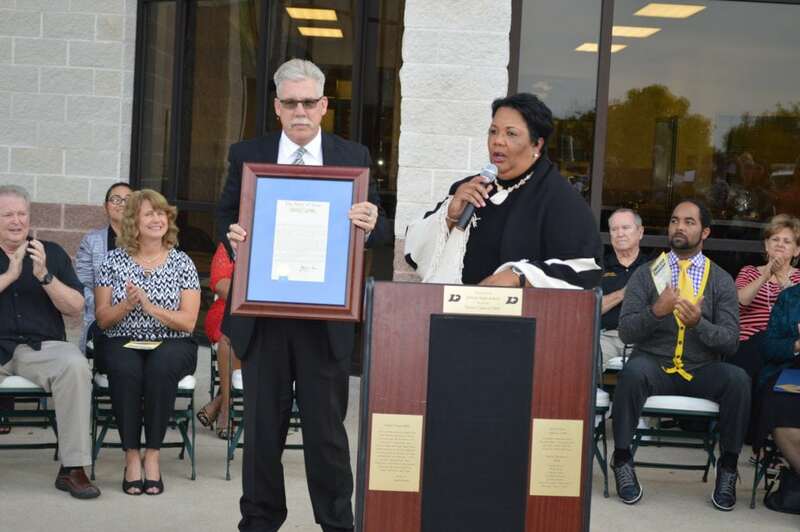 State Representative Yvonne Davis presents Coach Dyer with a resolution from the Texas House of Representatives. 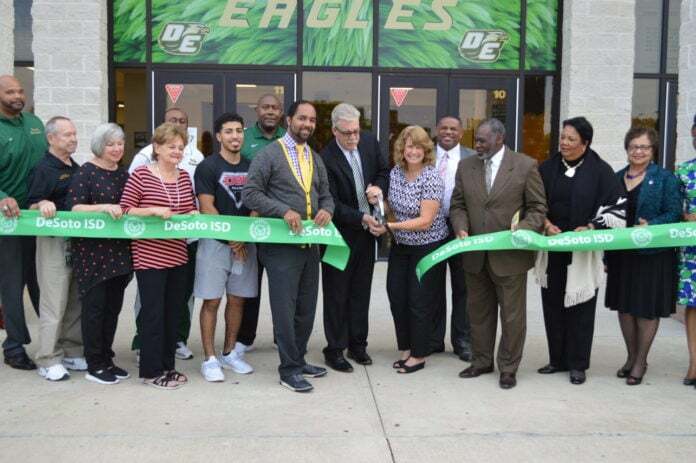 Dr. David Harris, DeSoto ISD Superintendent of Schools, greeted guests and welcomed the large crowd to DeSoto ISD. The audience included former Board Trustees, City dignitaries, former players and parents, coaches who both coached with him and against him, members of his church and family, plus district staff and fans. Dignitaries included Community Missionary Baptist Church Pastor Oscar Epps, State Representative Yvonne Davis, DeSoto Mayor Curtistene McCowan, Board Vice President Aubrey C. Hooper, and fellow coach and longtime friend Jerry Palermo who each brought unique and personal congratulations to Coach Dyer and his beloved wife Jean for their impact on generations of young people. Coach Dyer, clearly moved and humbled, thanked the district for naming the facility in his honor, but reminded everyone that what really matters is what takes place inside – not just the gym, but the whole school. He thanked the administration, coaches, teachers and parents for their support, then he thanked the students, in particular, the players, who have had an impact on him. Finally, he thanked his wife Jean for her unwavering support over the past 33 years of marriage. Coach Dyer and his wife Jean then stepped to center ribbon holding oversized DeSoto ISD scissors and flanked by dignitaries, joined by family and friends – they cut the ribbon thus officially declaring the facility by the new name – Chris Dyer Gymnasium. Guests then joined in the foyer for a reception with hors d’oeuvres and punch to share stories, take photos and commemorate the event. All guests were encouraged to sign the cut ribbon which was given to the Dyers as a keepsake, and congratulate Coach in a video that will be compiled and presented to him as well. DeSoto Head Basketball Coach Chris Dyer addresses ceremony attendees. DeSoto Boys’ Basketball Head Coach Christopher Dyer has been with DeSoto High School for 18 years and won the Boys State Championship three times in those 18 years – 2003, 2009 and 2016. He spent the previous 18 years with Dallas ISD winning titles as a head coach at Dallas South Oak Cliff and as an assistant coach at Kimball. In 2002, he coached in the Global Games, where the U.S. team defeated Yugoslavia for the gold medal and was an assistant in 2006 in the Jordan Classic. He was also the winning head coach for the West Team in the 2013 Jordan Classic held at the Barclay Center in New York City. Dyer has been married for 33 years to his wife Jean. Together they have an abundance of god-children throughout Texas.